Coaching is much more than having great drills. In order to help your athlete you must prepare them physically, mentally, and emotionally. Helping an athlete to understand the importance of hard work and confidence will not only make the process of acquiring new skills easier, it will also help your athlete to be proud of their progress and performance. 1. Teach your athletes that hard work pays off. Remind your athlete that working hard is fun. It is fun to gain strength. It is fun to get a little bit better each day. It is fun to be the best version of yourself. When you see your athlete working hard, building strength, and making progress recognize their accomplishments. Reward what you want to see more of. 2. Have a plan of attack to reach your goals. Set goals for the season, the month, and the practice. Arrive at each practice with lesson plans that are working towards your goals. Know that having a plan will help you to run a productive and successful practice. However, you must also realize that your plan will often require modifications to best meet the needs of your athlete. Communicate with the athlete what you expect. Do they have to make the skill to count it or is an attempt okay? Continue to raise the bar throughout the year, but don't forget to communicate that the expectation has changed. When using a consequence (keep in mind consequences are not always negative) for not meeting an expectation, it should relate to the problem. For example, if you fall off the beam push ups will not fix the problem. However, reinforcing great alignment on a line on floor will help. If your gymnast is struggling to keep their feet up on a glide kip then let them know that they need more opportunity to build their strength by doing a set of 5 glides or leg lifts. If you want to coach athletes with a positive attitude you must lead by example. Model the attitude you are looking for both with your words and with your body language. Recognize athletes who have a great attitude and reward the positives. 5. The mind is the strongest muscle in the body. Your mind controls every other muscle in the body. Training the brain takes time and practice. The mind can only focus on one thought at a time. 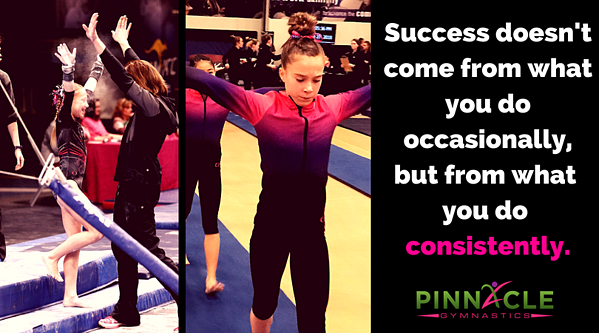 If your gymnast is frustrated or fearful that thought will often take precedent over the correction. Eliminating the fear or frustration will allow the gymnast to focus on improving their gymnastics. Because the mind focuses on one action at a time there is no need to give your gymnast five corrections. Choose one correction to work on at a time. Once that correction has been made, you can move onto another one. 1. Create opportunities for athletes to learn by doing. Baby Steps - Keep in mind that small steps taken consistently will go a long way. Progressions - Break the skill into pieces and allow the gymnast to learn a little bit each day. Think Goldilocks - Keep the Goldilocks rule in mind. You learn best when the task is not too hard, not too, but just right. Fall down 5 times, get up 6 - In order to learn a new skill you must continue to keep trying. Encourage gymnasts to try again when they make a mistake. The power of using YET - Instead of using the word can't, teach your gymnasts to use YET. I have mastered by kip YET. I am not quite ready, YET. Growth mindset - Encourage your athlete to have a growth mindset. If you keep working hard and practicing you have the ability to grow and learn new skills. Encourage failing not failure - Failing is part of the process. We all fail when we challenge ourselves to learn something new. Failure on the other hand is not. Failure is when an athlete gives up rather than using a mistake as part of the learning process. 3. Set standards high and don’t compromise on them. 5. Fill your gymnasts emotional tank. Athletes with an empty tank are pessimistic, give up easily, and are are less coachable. Athletes with a full tank are optimistic and much easier to coach. 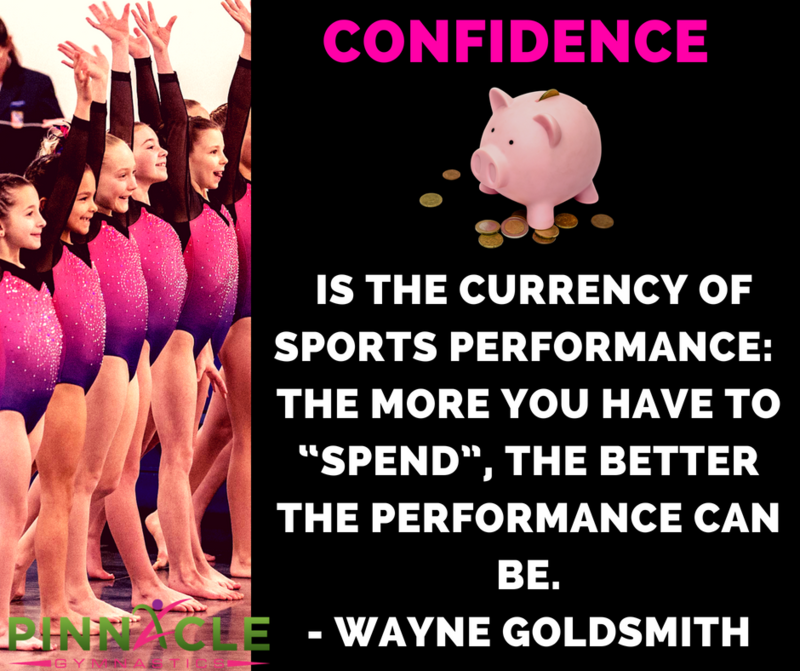 Criticism, corrections, sarcasm, ignoring an athlete will all drain a gymnast's tank. Honest, specific praise, expressing appreciation, and listening will fill a gymnast's tank. Coaches keep working hard to improve the whole athlete! You might be surprised to see how working on consistent effort and building confidence can make a difference in your athlete's skill development.